Lake Pointe Church has a live production control room that deploys Chyron graphics, and it is used at least once a week and generally more often. The system includes three screens utilized during a service, center and sides, and can drive each screen independently. The messages they want to deliver are clarion clear. Choosing the type of messenger is a little more complex. As more houses of worship move into broadcast production, adding technology for everything from acquisition to editing, opportunities abound in smaller congregations, too. We live in a “wannabe” industry, he said, where the larger churches possess influence and the smaller ones want to be at that same level of technology, although that does not always mean that they’re looking at the same tools; a 10,000-seat facility may have a substantial budget. Sudduth noted that Lake Pointe, for example, has a live production control room used at least once a week and generally more often. The system includes three screens utilized during a service, center and sides, and can drive each screen independently. Ministries such as that of televangelist Joel Osteen have had a remarkable influence on what HOW s request when going that route. “I can’t even tell you how many customers have mentioned Osteen Ministries and said they want what he uses,” he said. 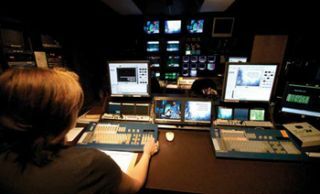 A new Broadcast Pix Slate 5000 is helping Abundant Life Family Worship Church produce high-quality video productions for public access and live streaming audiences. Streaming varies depending on the level of sophistication, he said. “They can grow into it when there is enough demand and desire to reach out past their physical boundaries. One of my accounts is the privately held Daystar Television in the Dallas/Fort Worth area, one of largest religious programming networks in the world, steaming everything they do. They’re not a HOW as such; rather they are a religious broadcasting network with stations all over the country. The HOW market is clearly more than independent churches: the networks are every bit as important in this market segment as they are in traditional broadcast venues. In many instances, a HOW might have members of their youth group who are already familiar with the latest desktop digital editing tools to create compelling content to be played back during services, noted Wohler’s McNall. Designing an HOW system is a consultative process with budgets dictating which tool sets are available for a given project. “More and more, we’re seeing system integrators who normally work in the traditional broadcast and/or sports arena markets working in the HOW environment,” he observed. RGB Spectrum has expanded the Linx family of matrix routing switchers: Linx Prime, which allows a mix and match of seven different I/O card/signal types plus scaling; and Linx F series, an all fiber switcher used in conjunction with RGB’s FiberDVI transmitters and receivers. Linx Prime is a multi-format switcher offering scaled outputs. The HDMI certified switchers offer full HDCP compliance over copper and fiber. The Linx F Series offers all the advantages of a switcher with advanced EDID management and HDCP compliance plus the ability to run over a single fiber up to 500 meters both in and out of the switch. Each modular card features two independent channels with SC connectors used in conjunction with FiberDVI transmit and receive units located at sources and displays. The Atlona AT-PRO2HD88M-SR and AT-PRO2HD1616M-SR are true 8x8 and 16x16 high-speed HDMI matrix switchers, featuring eight or 16 HDMI 1.4 inputs and eight or 16 independently switchable twisted pair outputs to feed eight or 16 separate receiver modules (included). The units have the ability to equalize, amplify, and reclock the signal to ensure HDMI-accurate signal transmission through long cables without quality loss. Featuring HDBaseT technology, the switchers extend HDMI sources up to 330 feet at 4000x2000 resolution over a single Cat-5/6/7 cable. PESA’S OC44-3G-P4 is a multirate, four input and four output high definition routing system with a full set of features for network control. Self-contained in a 1RU chassis, the OC44-3G-P4 offers full auto equalization at each input for cable lengths over 300 meters at 720p and 100 meters at 1080i or 1080p. Each output port can be configured for standard SMPTE re-clocking data rates or set for auto-bypass mode when non-SMPTE signals are required. This unit is capable of storing multiple switch presets and provides glitch-free switching with genlocked sources. Signal management control includes breakaway level switching and output signal locking. MultiDyne Video & Fiber Optic Systems’ EOS-5000 supports copper signals and fiber optic multimode and single-mode fiber feeds. The EOS-5000 supports data rates from 10 Mbps up to 10 Gbps. This will include 3G HDSDI video and all standard SDI video formats in the copper and optical domain. The EOS-5000 is available from 36x36 up to 144x144 in one chassis. By providing copper inputs and outputs, a local monitor can receive a copper input directly from the router. The optical output will no longer require a conversion from optical to copper. The EOS-5000 features a front panel programmable LCD display with setup menu and diagnostics along with automatic failover, and redundant controllers. The HD4-44 HDMI multi-function switch allows multiple and single display of HDMI sources simultaneously. Switch source device for each display by using remote control, manual push button, or with RS232. Optional IR adapter is perfect for home theater to control the source remotely. Any source to any display matrix switching allows versatility for integrated digital signage systems. The switcher features mounting wings and slim design for installation flexibility. It supports full HD HDMI 1.4a/HDCP, 3D, 1080p, deep color 36bit, Xv-YCC, DTS-HD, Dolby TrueHD multi-channel digital audio, LPCM7.1, DSD, Blu-ray player for 24fs film format, and 6.75Gbps data transfer speed. Key Digital Systems’ Hercules Series KD-HDMS8x8-13x3 matrix switcher is an advanced HDMI matrix switcher designed especially for board/conference room applications due to 16 flexible slots, which can be configured for any combination of 16. The KD-HDMS8x8-13x3 allows for easy programming, simple operation, and flexibility due to full audio control for each output including: volume, treble, bass, balance, and lip-sync. Further simplifying a board/conference room AV system installation is the KD-HDMS8x8- 13x3’s ability to be controlled by IP and connect between IP and RS-232 connections. Crestron’s 8x8 high bandwidth RGB matrix switcher features ultra high-bandwidth 800 MHz matrix switching, built-in audio DSP, and automatic ducking. The CEN-RGBHVHB8X8 is capable of routing up to eight computer or video sources to up to eight display devices. Its five matrix levels accommodate any combination of analog RGBHV, HD/ component, S-video and composite signals. Sync impedances for each input are selectable from the front panel or software to accommodate both short and long cable runs. Featuring an informative LCD display, quick-adjust knob, and quick access buttons, the front panel supports essential switcher operation without requiring a computer or control system. Advanced setup is available through Crestron Toolbox software. All signal routing, input impedances, and audio settings are stored in non-volatile memory onboard the switcher. The GefenPRO 32x32 DVI Matrix offers cross-point switching among 32 computers and displays, with a one-to-one or one-to-many routing, controlled by front-panel button, RS-232, IR remote, or IP control. This matrix offers an open architecture that supports DVI and HDMI (with adapter) sources, outputting all video in the DVI format. It is a modular card cage system allowing different configurations of several inputs/outputs modules, with the added option to extend any number of outputs over CAT-5 or fiber optic cables. Though designed to supply AV and studio professionals with a solution for switching many different sources to many locations, it is also appropriate for digital signage, large presentations, and video walls that need immediate access to many computers. Xantech’s 9-input presentation scaler/switcher accepts NTSC, PAL and SECAM standard video in composite, S-video or component video format, as well as JPEG inputs, via RCA, 15-pin HD, HDMI, and USB connectors. On the audio side, the VCS1080 handles unbalanced stereo and S/ PDIF audio signals. A key feature is that the HDMI and VGA outputs are active at the same time, allowing users to distribute video to a projector and a flat-screen panel simultaneously. The VCS1080 incorporates IDT HQV video processing to ensure high quality scaling for large audience presentation applications requiring conversion and switching of multiple formats of standard- and high-definition video as well as graphic data signals. The HSM-I-04-04 is a four-in and four-out matrix switch with RS232 and IP Control. The video switch can be controlled from anywhere using a PC, smart phone, or tablet while supporting multiple simultaneous users. The IP (LAN) port includes a built-in web server with web-based software to control the switch from any modern browser. The embedded HSM IP Manager software allows the user to assign custom names for each input, output, and preset pattern, making control over IP simple. It is HDMI 1.3 compliant, supports HDCP and HDMI 1.4 3D, deep color, multi-channel digital audio (up to 7.1 channels), and may be used with any combination of DVI (PC) or HDMI (HDTV) sources and displays. The VG-Matrix series fiber optic matrix switchers deliver a modular and scalable full crosspoint matrix switching platform that can be field configured in increments of eight inputs and/or outputs up to a maximum of 160x160. Fiber I/O cards connect seamlessly to the fiber inputs or outputs of Voyager transmitters and receivers delivering matrix switching and long distance extension in one platform. Switch sizes larger than 160x160 are available. Other features include uncompressed multi-format digital and analog video at 1920x1200, auto format conversion between video and audio signal types, mixed singlemode and multimode fiber support, advanced EDID management and full HDCP compliance, as well as dual redundant, hot swappable power supplies with dual AC inputs. The XTP CrossPoint system from Extron is a flexible, reliable signal switching and distribution system that provides an integrated solution for multiple digital and analog formats. XTP CrossPoint Systems support local connectivity, as well as extended transmission capability for sending high resolution video, audio, RS-232, ethernet, and power up to 330 feet over a single Cat-5-type cable. Other technologies incorporated into the XTP CrossPoint systems include SpeedSwitch technology, EDID Minder, and Key Minder for fast, reliable switching of HDMI and DVI signals and HDCP-encrypted content, SD Pro processing for de-interlacing standard definition signals to eliminate display compatibility issues, and automatic input cable equalization and output reclocking that provide digital video signal conditioning to ensure optimal performance. Kramer Electronics has introduced the VP-747 In-CTRL dual scaler seamless switcher with eight sets of universal inputs. The universal inputs are comprised of five BNC connectors each, two of which can also be used as HDMI/ DVI inputs on DVI connectors. A key feature of the VP-747 is the incorporation of HQV processing technology for image quality, which represents the state-of-the-art in video processing technology. It offers the highest quality de-interlacing (with 3:2 and 2:2 pull down), advanced noise reduction that reduces block chroma and mosquito noise, and scaling performance for both standard and high-definition signals.